Role models play a huge role in many people’s lives old and young. They give us inspiration, encouragement, determination to keep going in life even when things look gloomy. They sometimes even represent hope for those who think they’ve lost it. The example I will be using is one of my favorite animes is Angel Beats and my favorite character from there is Masami Iwasawa-Chan! She is considered a role model to me because I can relate to her situation very well family matter wise. I feel young children desperately search for a role model so that they can set goals for themselves and save themselves from things they don’t want to deal with in reality. Many young teens nowadays go through a ton of drama regardless of whether it is concerning family, friends, relationships, or they just have so much anger bottled inside of them. Whatever the cause of the problem may be they are always searching for a way to release that sorrow, that pain, that anger, those emotions. Many find ways to release that anger through drawing, singing, playing instruments, playing sports, journaling, or whatever they find to release that rage. Iwasawa-Chan should be a role model to many young teens as the type of girl who endured a sad life with parents who are always fighting and she had to pay for the consequences for trying to stop the fighting. What I find about her that is so admirable is that she managed to find the one thing in the world that wouldn’t let go of her hand even when her parents’ did. She confided in music and guitar playing and it had saved her briefly. She didn’t have to turn to drugs or bad influences to save herself is my main point. Because she found a role model and that role model inspired and created a safe haven for her to be, she was able to protect herself and create her own happiness in the darkness she was surrounded in. Not every unhappy matter or thing teens are going through has to be resolved in harming one’s self or turning to bad influences. There are a ton of other options to save yourself and save those you care about. 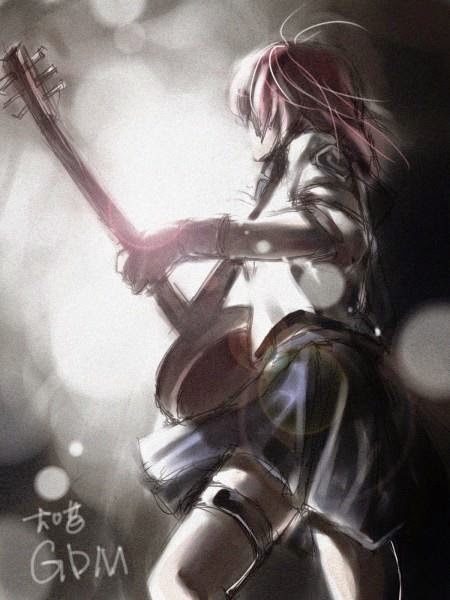 Despite Iwasawa-Chan’s fate later on in the anime where she suffered a stroke and died from it, she still clung onto her talent and didn’t lose sight of the inspiration she was given by her role model to keep playing and singing even in her afterlife. Her unwavering determination and will of fire to protect what she found to keep her moving forward in life is respectable. I feel that we should all learn from her especially troubled young teens. Who knows you can find your true talent and passion in your search for a role model. Sometimes it only takes a passion to keep pushing one to move forward than remain stuck in a tragic situation and do nothing. If Iwasawa-Chan can do it, so can you all!